A situation in which a government, especially the U.S. Government, borrows so much money that it discourages lending to private businesses. Crowding out generally occurs because lenders prefer the government as a borrower because it is much less risky and the government is able to pay any interest rate. Thus, when the government is borrowing heavily and lenders have only a finite amount they can lend, it may crowd out private borrowers. Fig. 34 Crowding-out effect. (b) This causes the equilibrium INTEREST RATE to rise (from r to r 1), which then reduces - ‘crowds out'- an amount of private INVESTMENT (?T). 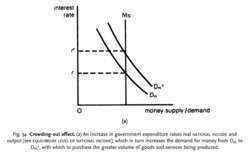 (c) An increase in government expenditure by itself would increase AGGREGATE DEMAND from AD to AD1, but, allowing for the fall in private investment, the net result is to increase aggregate demand to only AD2. Fig. 34 Crowding-out effect. (a) An increase in government expenditure raises real NATIONAL INCOME and output (see EQUILIBRIUM LEVEL OF NATIONAL INCOME), which in turn increases the demand for money from Dm to Dm1, with which to purchase the greater volume of goods and services being produced. an increase in GOVERNMENT EXPENDITURE that has the effect of reducing the level of private sector spending. Financial crowding-out of the type described in the captions to Fig. 34 would occur only to the extent that the MONEY SUPPLY is fixed, so that additional loanable funds are not forthcoming to finance the government's additional expenditure. If money supply is fixed, then increases in the PUBLIC SECTOR BORROWING REQUIREMENT associated with additional government expenditure will tend to increase interest rates as the government borrows more, these higher interest rates serving to discourage private sector investment. On the other hand, if additional loanable funds were obtainable from, say, abroad, then additional government borrowing could be financed with little increase in interest rates or effect on private investment. The term ‘crowding-out’ is also used in a broader sense to denote the effect of larger government expenditure in pre-empting national resources, leaving less for private consumption spending, private sector investment and for exports. Such real crowding-out would occur only to the extent that total national resources are fixed and fully employed so that expansion in public sector claims on resources contract the amount left for the private sector. Where unemployed resources can be brought into use, additional claims by both the public and private sectors can be met. 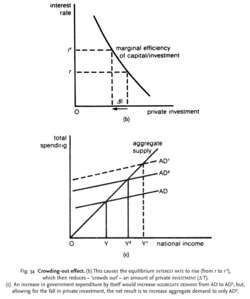 See MONEY-SUPPLY/SPENDING LINKAGES, MARGINAL EFFICIENCY OF CAPITAL/ INVESTMENT.